In 2012, 2013 and 2014, I attended the International Free Software Forum (FISL), held in the south of Brazil, and I had a great time in all those editions. In each edition, someone told me that if I enjoy FISL I’d enjoy FOSDEM as well. This year I decided to attend FOSDEM and, despite the queues, I met with Mateusz Kuzak to discuss some community driven projects. On FOSDEM's first day, after the welcome talk, we went to the HPC, Big Data and Data Science room and watched Michael Bauer's and César Gómez-Martín's talk about Singularity, another container-like technology, use on the HPC environment. If you want to learn more about Singularity, you should consider attending our Docker Containers for Reproducible Research Workshop in June 2017. FOSDEM doesn't have a lunch slot on the programme and having 27 rooms hosting activities in parallel doesn't help you select a slot for a break. We decided to have an early lunch after our second talk since the next talk on the HPC room was about "how supercomputing is being made available to all Cuban researchers"—something that wasn't a priority for us. 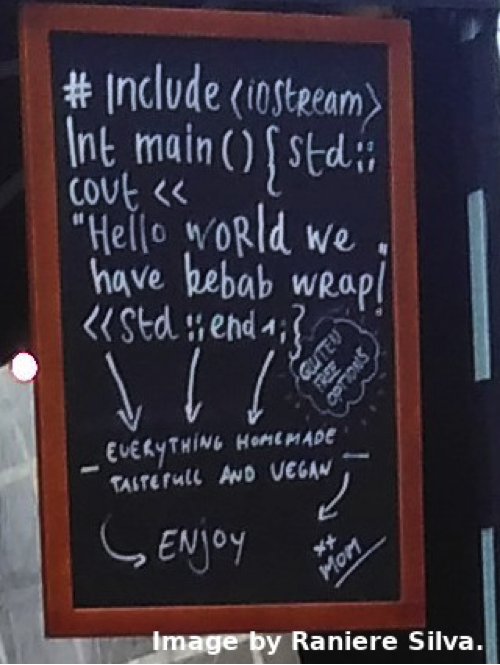 For lunch, we had a vegan, gluten-free hamburger from "Just like your mum catering" which had a great C++ code snippet on the chalkboard that you can check in the photo below. I had to hold myself back as it was very tempting to ask the staff to rewrite their advertisement in Python. After lunch, Mateusz went back to the HPC room, and I spend a few hours queueing for another room until I gave up and found somewhere to a sit and hack some scripts. One of the lessons that I learned at that point was that you should pick one room and camp on it if you want to see any of the talks on that room, or bring a big power bank so that you can plug your smartphone to watch the live stream from other rooms. 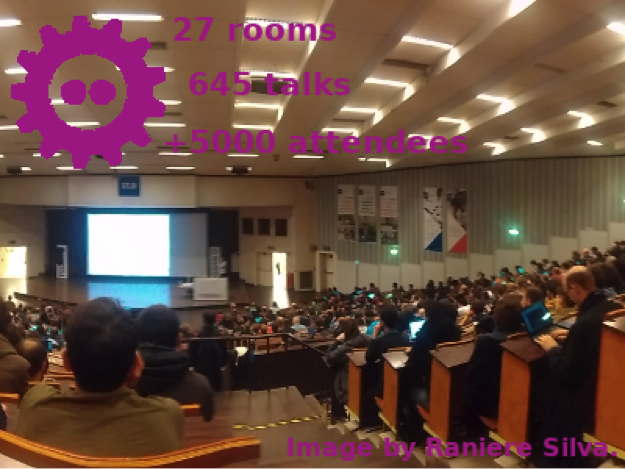 On FOSDEM's second day, we went to the Community room where we watched great talks. Manrique Lopez demoed Grimoire Lab—a great tool if you need to get some data visualisations based on issue trackers and mailing lists. Deb Nicholson, whom I met before in Brazil during FISL—she gave me a GNU MediaGoblin sticker at the speaker room back in 2013, although she probably doesn't remember—,gave us some tips on how to handle conflict in open source communities. Brian Proffitt talked about how to mentor someone and programmes around the world dedicated to mentor new developers in open source projects, such as Google Summer of Code and Outreachy. We also learnt how to improve contributor retention rates with Bee Padalkar. Bee presented some metrics from Mozilla and Fedora showing that most of the contributors first engaged with an open source project by attending an event, like FISL or FOSDEM. She said it is very important to follow-up with the attendees after the event to further engage with them. Here at the Software Sustainability Institute, we organise speed blogging at some of our events because they offer us the opportunity to keep in touch with our attendees during the weeks following the event. It's important to make a good first impression if you want to get engagement from contributors after an event. This was the topic of Jenny Wong's amazing talk. Many event organisers worry about diversity of attendees but, as stated by Jenny, they are looking at the problem from the wrong angle. Event organisers should worry about inclusivity, which means bringing accessibility to the core of any discussion. To be inclusive, Jenny advises us to make all tickets free, pay £2344.00 for one kid child care, and £5,218.70 for live captions. Although, "budget or size of event does not matter" because lots of "small" details, such as a welcoming word, go a long way. If you want to see all of Jenny's tips in action, you should attend Wordcamp London 2017 on 17th-19th March. The Community room totally made my participation in FOSDEM worth it. Talks will be available online, if they’re not already. I was a little disappointed that there was no room dedicated for academic research. FISL had a academic research track in the first edition that I attended, in 2012, and it was along those lines that in 2013 I made my debut talking about LaTeX and Git. In 2014, FISL didn't have an academic research track. If you think FOSDEM 2018 should have an academic research room, e.g., to discuss R (they also didn't have an R room), Jupyter, LaTeX or any topic that you think could make your research better, let us and them know. Overall, I enjoyed attending FISL because I was part of a diverse group for a few days, which discussed free and open source. FOSDEM attendees are a diverse group as well—you will not only meet software developers but lawyers, journalists, designers, etc whom has different beliefs —from which you can learn a lot regardless of where you are—lecture room, corridors, food corner, bus stop—. I thoroughly enjoyed being part of FOSDEM 2017 and recommend it to anyone who uses any open source software.